His recent work includes WHERE’S YOUR MAMA GONE? a play based on the experiences of two children whose mother fell victim to a serial killer. A Heritage Lottery Funded exhibition was created around the play looking at heritage loss in looked after children. The play has been widely performed – six weeks at the Carriageworks Theatre, Leeds, four weeks at the New End Theatre, London, four weeks at the Hen & Chickens Theatre, London A BIG DAY FOR THE GOLDBERGS a comedy looking at provincial Jewish life and premiered at the Leeds Jewish Performing Arts Festival in 2011 with subsequent productions at Leeds Carriageworks Theatre, the New End Theatre, Hampstead, Edinburgh Festival and toured throughout the UK. THE GOOD AND THE TRUE adapted from the original play produced by Svandovo Divadlo (Prague’s leading repertory theatre) and collaborating with Prague City Hall, this play toured the UK and ran in New York – off-Broadway for 8 weeks in the Summer of 2012. It was also performed for the United Nations New York. DON’T LEAVE ME NOW a play exploring the impact of early onset dementia on two very different families and inspired by two real stories. This play has had more than 150 performances throughout the UK. 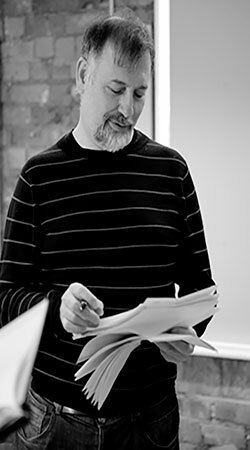 Brian’s 2016 commissions include HOMEWARD BOUND and BOUNCE BACK BOY both commissioned by the National Council for Palliative Care to be performed to engage care and health professionals to look at the complex issues around palliative care. FINISHING TOUCHES commissioned by a major London legal firm explores the impact of childhood sexual and physical abuse/grooming on the later lives of people. This play was workshopped at the Barbican Theatre, London in August 2016 and was performed in June 2017 at the new Fitzrovia Chapel Arts Centre in London and New Theatre Royal, Portsmouth. Another commissioned play available from October 2017 is FIGHTING FOR LIFE exploring the way in which elderly/frail people are treated by social and health service institutions. Brian is currently working on a community play for the Leeds Jewish Welfare Board to be performed late 2017. Fighting For Life will be launched at the Marie Curie Hospice, Hampstead, London on 25 January 2018. In 2018 another new play around the issues of resilience will be premiered. HELLO MY NAME IS….a play commissioned by St. Gemma’s Hospice, Leeds based on the life and work of the late Dr. Kate Granger whose inspiration that those engaged in healthcare always introduce themselves to their patients by saying ‘hello, my name is…’. In 2018 another new play around the issues of resilience will be premiered.